There’s something sneaky inside this apple cream cheese tart. Something that when you take your first bite, you dream of the holidays, and family, and cozy slippers. Yep. It’s the rum extract and nutmeg. Add those two together and you’ve got eggnog impersonators! No actual eggnog is used, but that warm, comforting flavor paired with the brown sugar apples is such a delicious treat! WELCOME TO APPLE WEEK everyone! I’ll be sharing three new recipes this week, all highlighting this delicious ingredient. 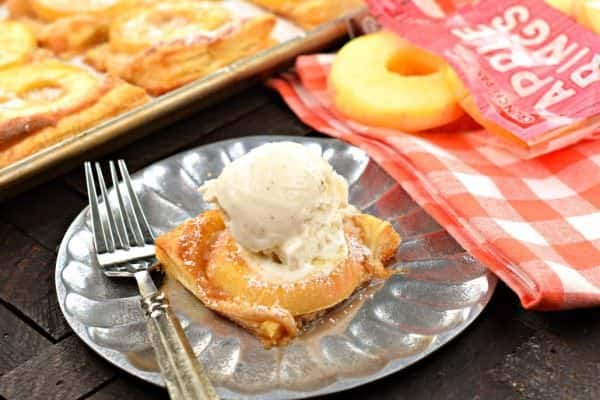 You’ll also see my friend Jocelyn, from Inside BruCrew Life is sharing three new apple ring recipes too! We jokingly call ourselves the Crunch Pak girls. Stay tuned as we have some delicious apple treats up our sleeves this week! 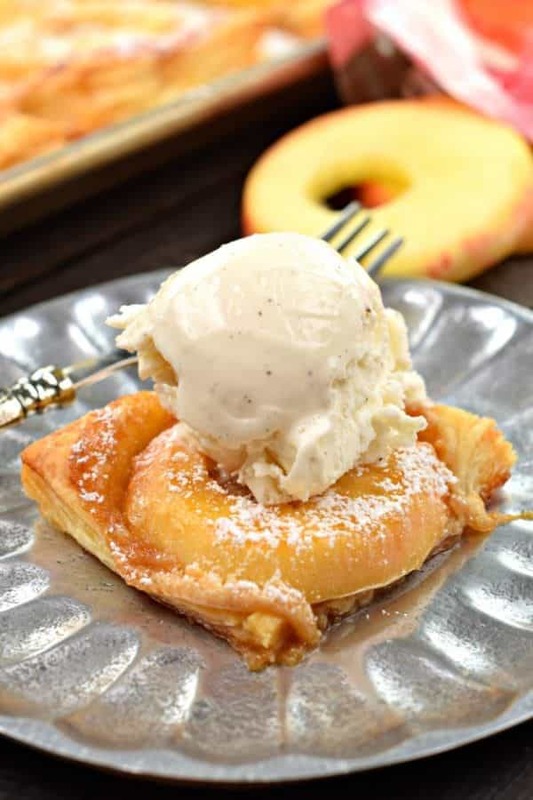 The star of this Apple Cream Cheese Tart are the beautiful Crunch Pak Apple Rings. You may remember first seeing these apple rings from Crunch Pak when I shared this Apple Ring Fritters recipe. Oh my gosh, those were so good. And I still can’t decide which way I enjoyed them more…dipped in caramel or chocolate! Today I’m sharing an EASY (yes E-A-S-Y) dessert idea. 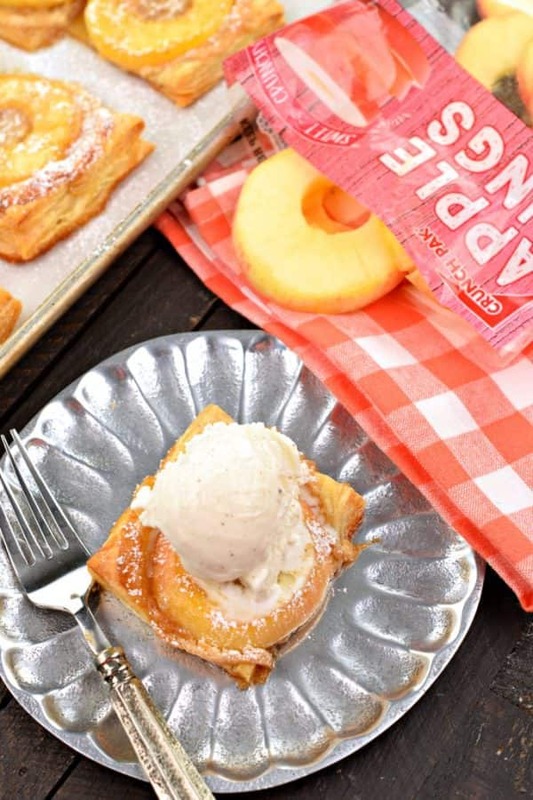 Using puff pastry and Crunch Pak apple rings you’ll LOVE whipping up this treat and impressing your family and friends. Like I mentioned earlier too, one bite of this dessert and the powerful flavors of rum and nutmeg shine. This will the your go-to recipe this holiday season! You’ll need to let your frozen puff pastry thaw for about 40 minutes on the counter. I place it (folded and frozen) on a silpat baking sheet. Now’s a good time to hop on the treadmill, burn a few calories BEFORE you even take one bite, haha! 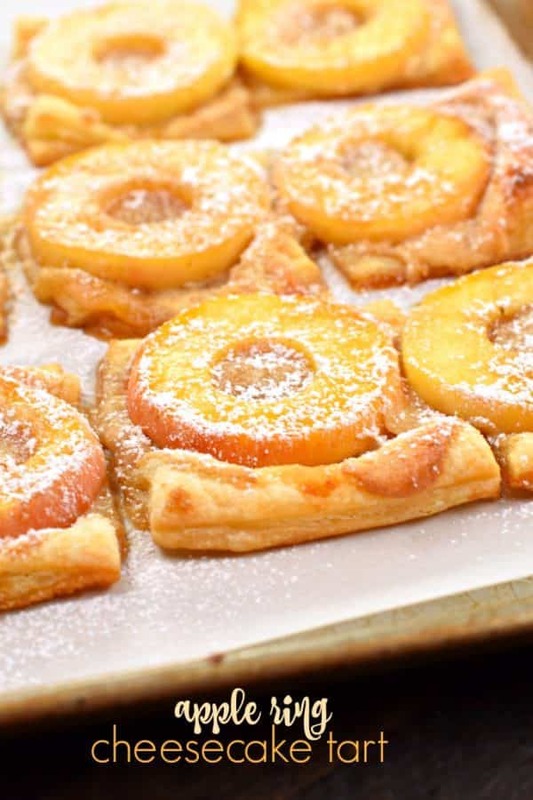 Using Crunch Pak Apple Rings is an easy, convenient step in making these tarts. Any variety works, choosing from their sweet and crunchy, sweet and tart, or tart and crunchy! When baking this tart, make sure you use a baking sheet that has edges! You don’t want the melted butter to drip off into your oven. If you prefer a more GOLDEN color to your tart, beat an egg yolk and brush it onto your tart before baking. Once these are done cooking, you’ll wonder if they are done, as the melted butter and sugar will be all over the pan. Allow them to cool a few minutes, then use a metal spatula and move them from the baking sheet to a serving platter. You’ll love that gooey cream cheese center. Don’t forget to add the powdered sugar and a scoop of vanilla ice cream. DELISH. Be sure to stop over at Jocelyn’s website today. She’s sharing a recipe for Caramel Apple Cheesecake Tarts. You’ll love her delicious twist to an easy treat! 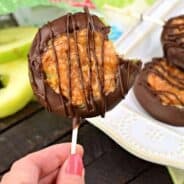 Stop on over to Crunch Pak for some delicious recipes and ideas! Unfold thawed puff pastry on a silpat or parchment paper lined baking sheet (make sure the baking sheet has sides). Cut the puff pastry into 9 equal sized pieces. Separate slightly on the baking sheet. In a mixing bowl, beat together the cream cheese, 1/4 cup of the brown sugar, rum extract, and nutmeg until smooth. Spread about 1-2 Tbsp onto each piece of puff pastry. Place one apple ring onto each piece. In a small bowl, whisk together the remaining 1/4 cup brown sugar with melted butter. Drizzle over the apple rings. Bake for 20-22 minutes until golden brown. Allow to cool about 5 minutes on pan, then transfer each piece to a serving plate. 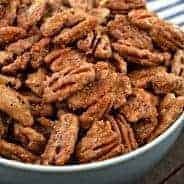 Sprinkle with powdered sugar and enjoy! Apple Cheesecake Napoleons: another easy apple dessert with puff pastry. Impressive too! Apple Hand Pies: you’ll want to make several batches of this delicious fall treat! Caramel Apple Bundt Cake: no denying, this cake is a a hit with family and friends! OMG I want to be a Cruch Pak girl too, where do I sign up?? I’ve never seen apples packaged this way, what a fabulous idea ~ I can’t wait to see what you come up with this week! Make that “Crunch” :/ I need another cup of coffee! Girl, that eggnog flavored cream cheese is calling my name! I can’t wait to try it with the apples. 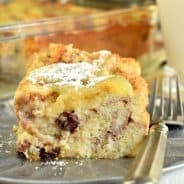 I love that you always make and post such similar recipes. Great minds do think alike! Those apple rings are so fun! They are perfect for baking–or snacking! My kids would love them. They are fun!! Making little peanut butter and granola sandwiches is delicious! 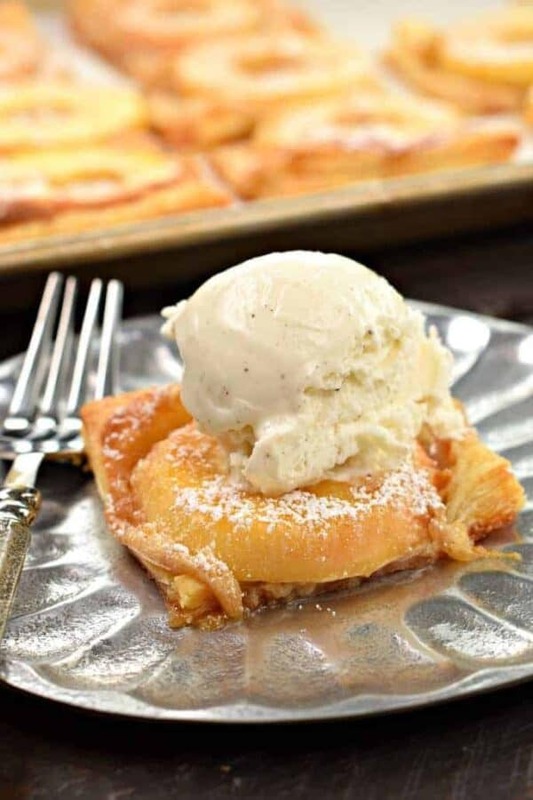 I am a SUCKER for any apple desserts…especially when cream cheese is involved! Perfect for the fall!! Love the eggnog flavors in the cream cheese! My family would love these! These apple rings are fantastic! I’ve never seen them in my grocery store, but I’m definitely going to ask about them next time! I love Crunch Pak apples! I’ll keep my eye out for the rings! Oh thank you!!! And yes, dem apples are GOOD. My boys would go NUTS for this!! I LOVE this idea! Especially with the ice cream on top!! This is such a delicious idea for fall! YUM! 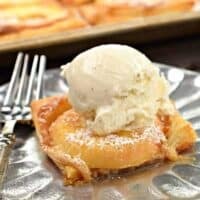 I have a girls night coming up, and this looks like the perfect dessert!